Gun Fight Didn't End Too Soon For House GOP, Some Democrats : It's All Politics With the failure of Senate gun-control legislation, House Republicans need not worry about a torrent of negative campaign ads against them over their opposition to such bills. Some Senate Democrats are likely breathing a sigh of relief, too. 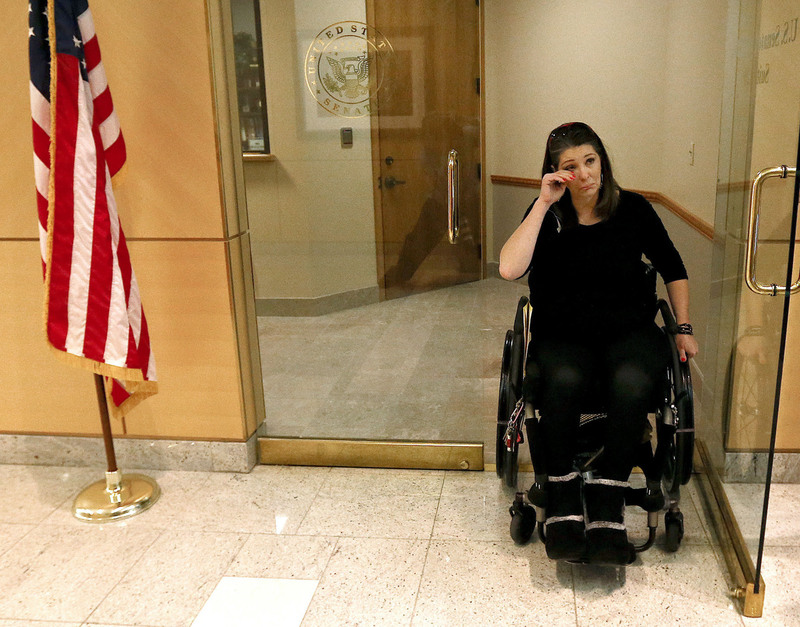 Jennifer Longdon, who survived gun violence but was left a paraplegic, wiped away tears at an April 19, 2013 protest at Arizona Republican Sen. Jeff Flake's Phoenix office. It was inevitable that each side of the gun debate would accuse the other of playing politics — especially after the failure this week of legislation to expand background checks to gun shows and Internet sales. And, to some extent, they're both right, as politics are never too far away from the surface of any controversial Washington policy debate. House Republicans were the clear political beneficiaries of the Senate's rejection of the bipartisan background check bill. When asked in recent weeks to explain what would likely happen in the House on gun legislation, Speaker John Boehner's standard refrain was that the Republican-controlled House would wait to see what the Senate produced before proceeding. Now it doesn't need to. That should spare the House GOP from an onslaught of 2014 election TV ads from Democrats skewering Republicans on their gun votes; or from New York City Mayor Michael Bloomberg, an independent, for that matter. The billionaire, who has vowed to spend millions of dollars to help pro-gun-control candidates get elected, indicated after the gun-control bills died in the Senate that he intends to make lawmakers pay. It now will be harder for him to target House Republicans for vengeance on the issue. In the Senate, where gun-control votes did occur, the dynamics were somewhat reversed. It was Republicans who seemed to have less angst; for some Democrats, namely those facing 2012 re-election in states President Obama handily lost, the issue probably couldn't go away fast enough. Senate Democrats like Mark Pryor in Arkansas, Mark Begich of Alaska and Max Baucus of Montana, who all voted against the legislation, all represent states with strong gun cultures. Democrat Mary Landrieu of Louisiana, who also represents a state with a strong gun culture and faces a tough re-election in 2014, voted for the measure. Nevertheless, the longer the gun-control debate dragged on, the more it allowed their political opponents to remind voters of these lawmakers' allegiance to the Democratic Party and Obama. "This is an unhelpful conversation for these red-state Democrats," said Brook Hougesen, press secretary for the National Republican Senatorial Committee. "The longer it continues, the longer the year leading into 2014 is going to be for them." While the Senate vote on the legislation put more Democrats than Republicans on the defensive, Democrats at least saw their side as having the better moral argument. "It's too early to know for sure how this is going to play out for either side, but the choice between our two parties is clear. Mitch McConnell and 40 other Republicans did everything they could to kill the bill. ... If every Democratic senator voted for the measure, the bill would not have had the votes to pass because of Republican obstruction." This blog post originally said Sen. Mary Landrieu, D-La., voted against the measure to expand background checks.